We bring you the latest trending designer brands in eyewear in Long Island. Our display shelves are packed with popular American and European names, such as La font, Lindberg, Dolce Gabbana, Face a Face, Prada, and Tom Ford, and many more. Choose from artistic color patterns, understated rimless, bold geometric shapes, glitzy gemstone decorations, and other fashionable features to express your personal taste. Not sure which design flatters your face? Our opticians will be pleased to help match your eyeglasses and sunglasses to complement your look – we provide professional and personalized service. 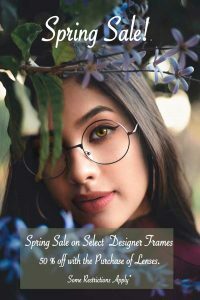 When choosing the frames of your eyeglasses in Plainview, NY, don’t forget about the importance of having the right lenses too. Optimal vision depends heavily about having the right lenses and lens coatings. We offer a wide range of lens treatments and coatings, all of which offer unique benefits. Your options include anti-scratch, anti-glare, UV coatings, shatter-proof, advanced aspheric lenses, Transitions photochromic, and thin lightweight high-index lenses. We also offer Essilor Eyezen glasses to help avoid the symptoms of digital eyestrain. Our optical staff will be pleased to explain all of these choices to you! Judith Leiber represents style and sophistication. A premier American luxury brand that has redefined elegance.